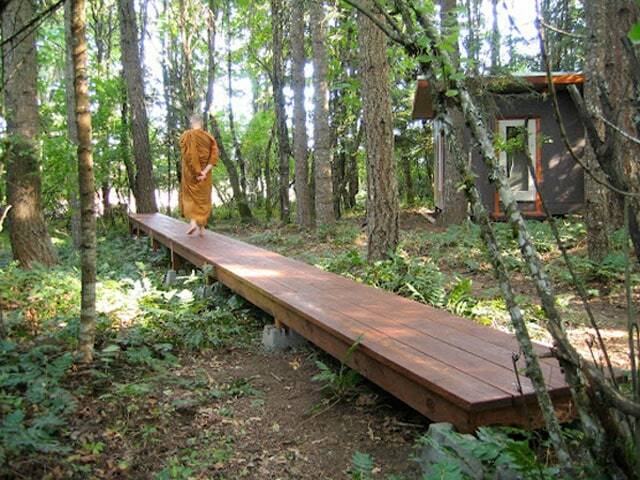 Walking meditation is a wonderful complement to your seated meditation practice. For some people, it is actually an introduction for it, since it is easier to start with. In this post I will explore the importance and the “how to” of walking meditation in the traditions of Buddhism, Yoga, and Daoism (Taoism). Six different techniques will be covered. This post complements the seated meditation techniques I wrote earlier. At the bottom of this page you will find a button to download a FREE PDF copy of this post, for easy reference. Walking meditation is more than a simple stroll in the park. It is usually done much slower than normal walks, and involves either coordination with the breathing, or specific focusing practices. It looks more like meditation than like walking. Unlike seated meditation, when walking your eyes are open, body is standing and moving, and there is a bit more interaction with the outside world. Because the body is moving, it is easier to be mindful of the body sensations and anchored in the present moment; for this reason, many people find walking meditation easier than seated meditation. Here are some things to keep in mind, regardless of the “type” of walking meditation you choose. Place. It may feel a bit awkward in the beginning, so you might consider doing walking meditation first in your backyard. If you are walking outside, find a secluded place where you won’t be distracted or disturbed. Ideally, the walking path should be slightly enclosed, so there is less distraction from the scenery, and the mind can more easily go inwards. Stay away from high-traffic and heavily populated walking areas. It’s also important that you feel safe in your surroundings. Length. Ideally practice for at least 15 minutes. Since there is no discomfort of seated practice or of not moving, you can naturally do it for longer periods than seated meditation. Pace. Slow is better. Pace should be steady and even. If your mind is agitated, or your ability to focus is weak, walk very slowly, until you can stay in the present moment with each step. Anchoring. Before you start your walking session, spend a minute or two just standing there, breathing deeply and anchoring your attention in your body. Stand with your feet hip-width apart and balance your weight evenly on both feet. Take the time to feel the stability of the ground beneath you. Take a few deep breaths. Close your eyes and do a scan of your whole body, starting at your feet. Make note of any sensations, thoughts or feelings and take the time to explore the sensations fully. Bring your awareness to your body, noticing how your body feels as you are standing, and becoming aware of all the sensations going on in your body. Technique. Choose one of the six techniques explained in this post. If you don’t know which to try, read my recommendation at the end of this article. Re-focusing. Just as in seated meditation, whenever your mind starts to engage with thoughts (or any type of mental content), bring your attention back to your walking and your breathing. Attitude. We are not going anywhere. There is nothing to achieve, except mastering our attention and presence. Simply be with the process. The ability of focusing, developed in walking meditation, is easily carried into our daily life. And also into seated practice, when there are actually less sensory stimuli. It’s a powerful tool at your disposal. For those that do long sessions of seated practice, walking meditation can be helpful to overcome the torpor and lethargy that unavoidably comes. And also offer a chance for the body to replenish. 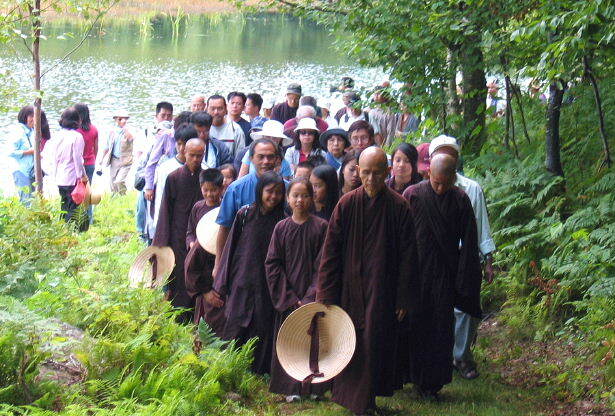 In the Theravada Buddhist tradition, walking meditation is an essential part of their training and lifestyle. In Thailand monasteries, many monks will walk for long hours as a way of developing concentrations – sometimes as much as ten or fifteen hours a day! Of all walking meditations that I found, this is the one with the most elaborate mental aspect of the training. For this type of walking meditation, choose a straight path of about 30 to 40 feet long. You can practice barefoot, or wearing light shoes. Stand upright, with eyes cast down about a meter and a half in front (to prevent distraction), not looking at anything in particular. Some people find it useful to keep the eyelids half closed. As you walk, place all your attention at the soles of the feet, on the sensations and feelings as they arise and pass away. Feel the legs and feet tense as you lift the leg. Feel the movement of the leg as it swings through the air. Note the sensations felt. As the foot comes down again into contact with the path, a new feeling arises. Place your awareness on that sensation, as it is felt through the sole of the foot. Again as the foot lifts, mentally note the feeling as it arises. At each new step, certain new feelings are experienced and old feelings cease – feeling arising, feeling passing away, feeling arising, feeling passing away. This should be known with mindfulness. Be constantly mindful of all sensations that arise in the sole of the feet. There is no “right” experience. Just see how the experience feels to you. Walk back and forth along the same short path. When you come to the end of your path, come to a full stop, turn around, stop again, and then start again. In the beginning, middle and end of the path, ask “Where is my mind? Is it on the soles of the feet?”, and thus reestablish mindfulness. Whenever your mind wanders from this focus, you bring it back to your foot, and the sensations for the contact with the ground. Your speed might change during a period of walking meditation. See if you can sense the pace that keeps you most intimate with and attentive to the physical experience of walking. At any time if you feel the mind is going deeply into tranquility, and you feel like just standing still, or sitting down to practice, then do so. Try to dedicate your attention to the sensations of walking and let go of everything else. As you develop your ability of focus while walking like this, by time you can also integrate it in less formal walks in your daily life. Eventually you will notice all six of the components of walking – raising, lifting, pushing, dropping, touching, and pressing. To help keep the mind in the process, you may also mentally note what is happening (“lifting”, “moving”, “placing”, etc.). In addition to noting, walking by counting – a focus on developing stability and mental concentration – is another practice that can assist you when your mind is distracted. In this practice, you can walk at a normal pace. When you take your first step, you count 1. On the next two steps, you say 1, 2. On the next three steps, you say 1, 2, 3. The next four steps are 1, 2, 3, 4, and so on all the way up to 10. When you reach 10, you say 10, then 10, 9 for the next two steps; then 10, 9, 8 for the next three steps, etc. Instead of focusing on the soles of your feet, you can do loving-kindness meditation while you walk. In each step, focus on the feelings of loving-kindness, and think “May all beings be happy, may all beings be at peace, may all beings be free from all suffering“. And also “May I be happy, may I be at peace, may I be free from all suffering”. If powerful emotions or thoughts arise and call your attention away from the sensations of walking, it is often helpful to stop walking and attend to them. When they are no longer compelling, you can return to the walking meditation. You also might find that something beautiful or interesting catches your eye while walking. If you can’t let go of it, stop walking and do looking meditation. Continue walking when you have finished looking. You can also simply note, seeing, hearing, worrying. Ajahn Nyanadhammo suggest that, if while doing walking meditation you find that you’re getting drowsy, then you may need to activate the mind using a mantra, rather than calm it, so that it becomes more focused and awake. He suggests the use of a mantra like buddho, repeating it quietly to yourself over and over and over again. Increase the speed of repetition if the mind insists on wandering. Another option would be to walk a little faster. In Japanese Zen, this is called kinhin. Practitioners walk clockwise around a room, in a very specific posture. It is usually done between sessions of seated meditation practice (zazen). Stand up straight with your back upright but not stiff. Feel your feet touching the ground and let your weight distribute evenly. Curl the thumb of your left hand in and wrap your fingers around it. Place it just above your belly button. Wrap your right hand around it, resting your right thumb in the crevice formed between your left thumb and index finger. This is called shashu (see image above). Keep your eyes cast down about five or six feet in front, un-focused. With each complete breath (exhalation and inhalation), take a small step (the length of your foot), beginning with the right foot. Keep the body and mind walking and breathing in a well-balanced, concentrated way. Keep your focus on your breathing and stepping. This is the walking meditation with the slowest pace. I once did one hour of kinhin practice (during a night long meditation) and covered only about 150 meters! 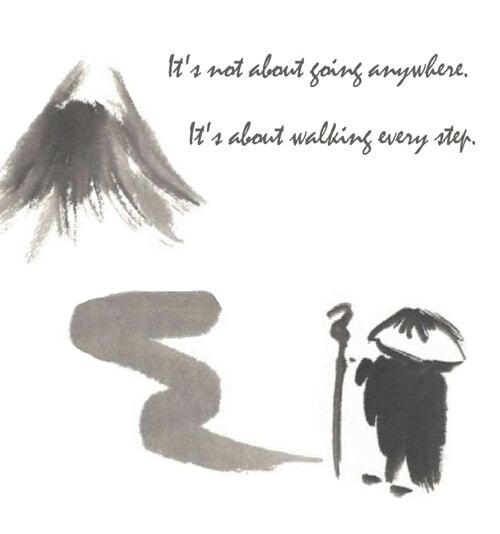 The Vietnamese monk Thich Nhat Hanh, which is a notable influence in the modern mindfulness movement and in modern Buddhism, has a simplified approach to walking meditation. Different from other techniques, this one makes use of affirmations in order to produce positive mental states. Be aware of each move, of each step. Keep bringing your attention to the present moment. Enjoy every step you take. Kiss the earth with your feet, imprinting gratitude and love as you walk. You can learn more about his approach and philosophy through a book he co-authored, Walking Meditation. This is an adaptation of traditional Buddhist walking meditation by the modern mindfulness movement. Instead of being a practice of concentration (focused attention) – as it is in the Theravada tradition – it is more of an open monitoring practice. In other words, the attention is not laser focused on the soles of the feet; instead, it is present to the variety of sensations and perceptions of the present moment. Pay attention to the experience of walking, and keep your awareness engaged in this experience. Feel your feet touching the ground. The movement of your muscles. The constant balancing and rebalancing of the body. Pay attention to any areas of stiffness or pain in the body, and consciously relax them. Be also aware of your location in space. The sounds around you. The air temperature. Be aware of the beginning, the middle, and the end of your stepping. Allow your awareness to move up through every part of the body, noticing the sensations as you walk. Gradually scan all parts of your body as you bring your attention to the ankles, skins, calves, knees, thighs, hips, pelvis, back, chest, shoulders, arms, neck, and head. Become aware of your present mental and emotional states. Notice your state of mind. Is it calm or busy, cloudy or focused? Where is your mind? In the Yoga tradition, walking meditation is not as popular as in the Buddhist tradition, where this type of meditation is more emphasized. In traditional Yoga, meditation seems to be always seated. The only practices I found were a couple by Swami Sivananda (in his old-school book The Science of Pranayama), and one by Swami Satyananda (in his book Sure Ways to Self-Realization) – of which I present adaptations here. If you know of other Yoga-based walking meditation, let me know and I’ll update this section. The idea of this exercise is to coordinate different types of pranayama (breathing regulation) with the stepping. This is often more challenging, from a breathing point of view, than other types of walking meditation. Unlike other practices, in which we simply observe the breath, in pranayama we actively guide the breath. It may require some previous training in these breathing exercises in seated position for you to be able to do it comfortably. Pranayama is a huge topic and there are many powerful practices. A more detailed exploration may be the subject of a future post. Before starting any of the following exercises, take some time to really calm the breathing. 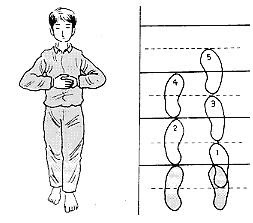 Breathe with the suggested pattern for a few times, just standing, before you start with the steps. In both cases, every step is one second. In this exercise there is inhalation, retention and exhalation, all the same length. You may increase or decrease the number of steps for each phase, according to your capacity. For instance, it could be 3-3-3-3 or 6-6-6-6. Here, the rhythm for inhalation-retention-exhalation is 1:4:2, which is more challenging. You can start with 2-8-4 or 3-12-6, and increase by time. This practice is traditionally called Chankramanam. Here you synchronize the mental repetition of a mantra with your steps. Keep your pace and your breathing steady, and repeate your mantra with each step (if it’s a short one); or break it into a few steps (for longer mantras). In the Chinese tradition we find some walking meditations that are more focused on physical health; others use visualization to harmonize body and mind; and yet others are more “freeform”. Let’s discuss a few of these exercises here. They are presented in no particular order, and are not requisites for one another. This is a technique taught in the lineage of Wang Liping. Walk normally, but in a slow pace. Breath in for 3, 6 or 12 steps. Breath out for the same number of steps. Do this a few times just standing, until you get used to the rhythm. While breathing in, visualize/feel the field of energy (qi) surrounding you being pulled into your lower dantien (the center two inches below the navel). While breathing out, visualize/feel the field of energy (qi) in your dantien expanding to a ball around you. A variation of this method is to hold your breath for the same number of steps, right after inhalation. Walk normally, but focus your attention on the dantien. Feel that your body is being pulled forward from this center, effortlessly. If you habitually lead with the head, chest, or pelvis, you may find this exercise grounding and energizing. The Daoist martial arts (like Taiji, Bagua, Xingyi) have very specific ways of walking. Although these do include some mental training as well, the emphasis is more on the physical health aspect, or on martial development. So I will not explore them in this post. For those interested, see this and this to have a taste for it. This employs the principle of non-doing (wu wei) to move without conscious mental effort, without destination or purpose, aimlessly. Find a flat terrain path outdoors where it’s not important to pay attention to the surroundings. It should be safe, secluded, quiet, still, and as empty as possible – so there is little distraction. An indoor walking path will also work. Find a circular or very long straight path to minimize the need to consciously change direction. The first few times around the path, look at everything to acclimate to the surroundings; then ignore everything. Wear comfortable shoes and clothing; carry whatever is needed to minimize self-consciousness, as long as it is lightweight. Walk at a leisurely pace, ignoring the surroundings as much as possible. Moderate the pace of the walk, so that the walking can be forgotten. Flash attention in and out of the meditative state to make any course adjustments on the walk, as needed. Walking is a healthy physical activity, and one that is also used in different spiritual traditions as a means of training the mind. So, which way should you practice? If you are already practicing inside a certain tradition, then following the walking meditation of that path makes sense. If not, you can explore them all and see what fits your needs better. As a generalization, we can say that the Mindfulness and Thich Nhat Hanh walking meditations are the simplest to start. The ones from Theravada and Zen are more concentrative practices, to really help deepen the meditation. The one from Yoga is most useful for training the breath. And the Daoist ones usually are more energy work. You can find more resources about walking and contemplation in this site. The content there is not so easy to consume, but there are plenty of things to read. Do you know anyone who would benefit from this content? Please share and help me spread the word about meditation practices. Join LiveAndDare's newsletter and get the PDF for free! You will receive in average one email a week, with "wisdom bytes" and new posts. NOTE: wait 5 seconds after pressing "Download".